Driving Serious Newspaper Ad Sales: Congrats on the Cash for Gold ad sale, Shannon! Congrats on the Cash for Gold ad sale, Shannon! A quick congratulations to Shannon Oseen at the Post Register on her sale of last week's "Cash for Gold" Presentation Pack ad. Shannon took a coin dealer from running a 2 column x 3" ad to a weekly 4 col x 15" ad by simply following the process outlined in the videos. These days, there's at least one of these places in every territory, so unless you already have more ad sales than you can handle, there's no excuse why members to this service haven't gotten out there and presented this already. If you're still feeling shaky on the sales techniques (for shame! ), pull me into a Web meeting with the prospect and I'll present it for you. We could even do it in an iPad Web meeting. Among other things, the ad has so many ways of proving that people will receive top dollar--the only thing people really care about when selling their gold and silver--that it was a no-brainer for the advertiser, especially after Shannon reviewed the content/size/frequency concepts I talk about in the videos. 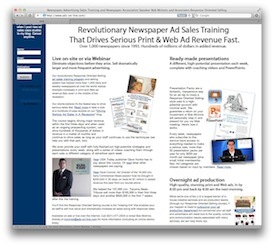 If you're not yet a member of our inexpensive live training, coaching, and presentation service for newspapers, you should learn more about our Presentation Pack service.